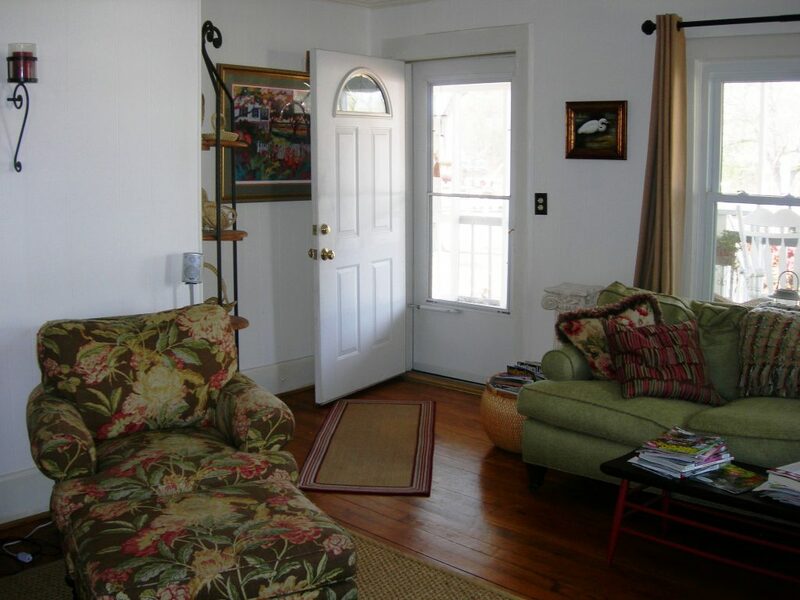 You are here: Home / home tour / Come On In! Hello! Come on into our cottage at the Crossroads. To bring you up-to-date, we moved here after I retired from teaching school. We’ve been here about a year and a half now, and we’ve really enjoyed renovating our home. By the way, this is the house that Leo grew up in, so it contains many happy memories for him. Many people couldn’t understand why we would want to live in this old, small house. In fact, some said that we should just tear it down and build a new house. But we welcomed the challenge of updating the house and maintaining the family home. Besides, we’ve lived in nice, new houses and we were ready for something that had some real character. Today I’m just going to show you the living room, the room where we spend most of our time. When you come in, this is what you’ll see first. We found this iron and pine piece in an antique store in Charleston, SC many years ago, and this is part of my sweetgrass basket collection. Many of the baskets were gifts, and a few of them were made by parents of students that I taught. All of them are truly treasures. 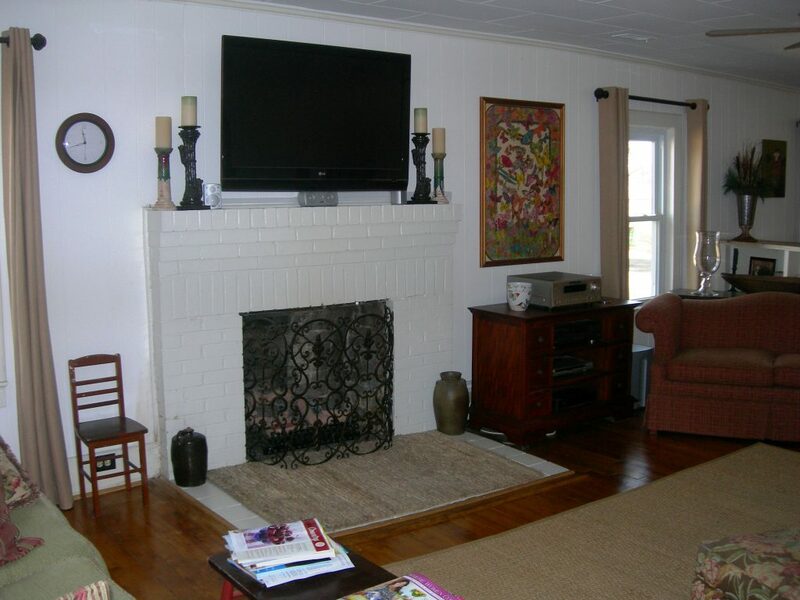 As you walk into the room, you will see the fireplace and the television. Painting the brick was such a major decision, but after I saw one almost exactly like it in a magazine, I knew we should do it. To the right of the fireplace, you’ll see something that looks like a framed tapestry.It’s actually a “pencil colored poster.” As we were cleaning out the storage building on the property, I found this tucked behind some other items. I asked my husband about it, and he said that his mother had done it when he was about 13 years old while she was recuperating from cancer treatments. (She was a 50 year cancer survivor!) It has found its permanent place in our home. Here’s our sofa. Those goose-down pillows always need fluffing. To the left of the sofa is one of my favorite paintings. The egret is another reminder of the Lowcountry. 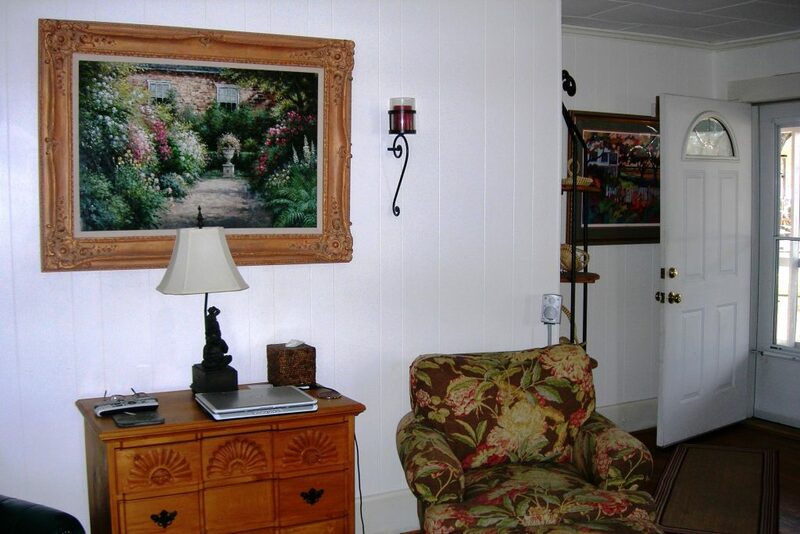 In the corner is a painting that we found many years ago in an antique store in Columbia. The window treatments are from Pottery Barn. 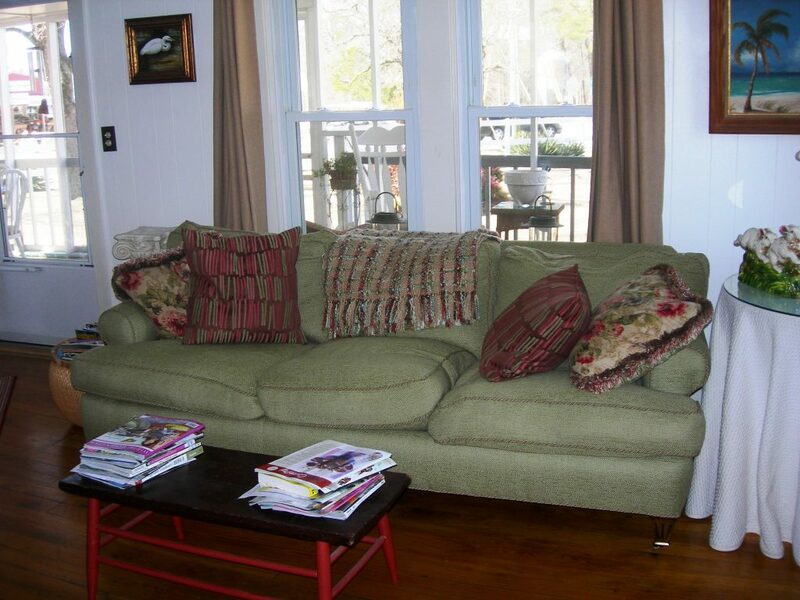 Behind the loveseat is a dough tray that I usually fill with seasonal decorations. It’s empty right now. I can’t seem to find my seashells and candles. Storage is an issue in a small cottage! You can see that this is really one huge room, which is unusual for such an old house. Leo said the dividers have been in the house for as long as he can remember. We decided to keep them. The tops are pine just like the floors. 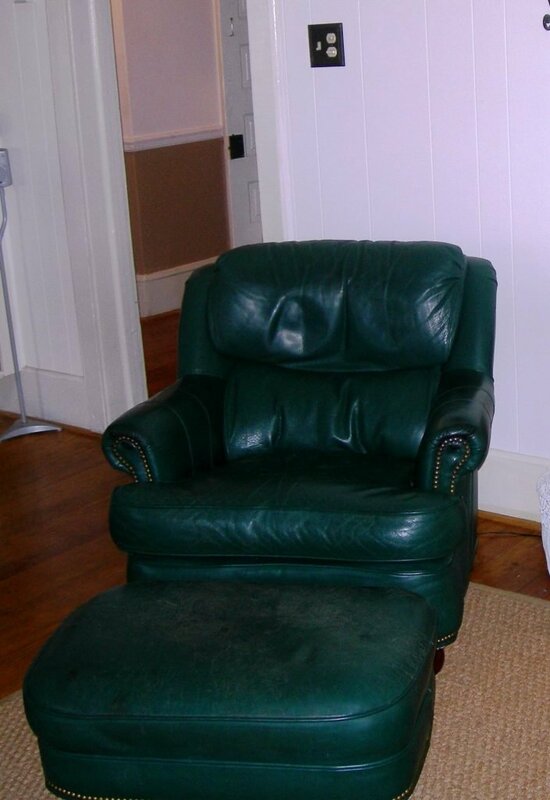 If that chair could talk, it would tell you the entire history of the NFL, the PGA , and the SEC for the past 15 years. That means that chair is old! And this is where it all happens. NO, not s**, the blog! See the computer? Cute cottage and I love places with character. New houses or apartments just feel cold. But you lost me with all that white. Sorry. It just screams old school hospital/doctor office. 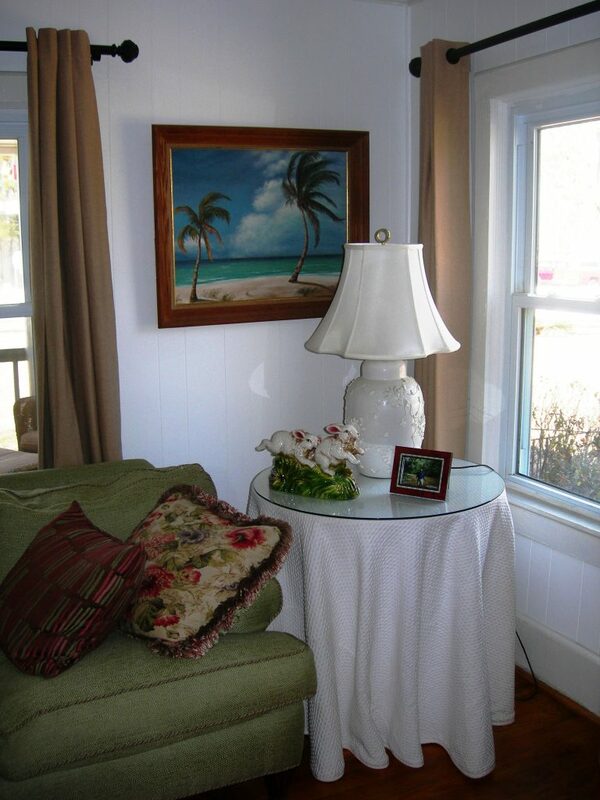 Yes white makes your small cottage appear larger but for me I would rather have a color..anything but white. Then again that could come from my parents home (mother choice..not fathers) which was all white. Every room and white wool wall to wall carpet. I am polar opposite of that. I like colors and lots of them…in every room. Thanks for sharing. I love your cottage but mostly the idea of caring on the “family home” for future generations. . This will be a special gift to all family members with personal touches such as the colored poster. How beautiful. 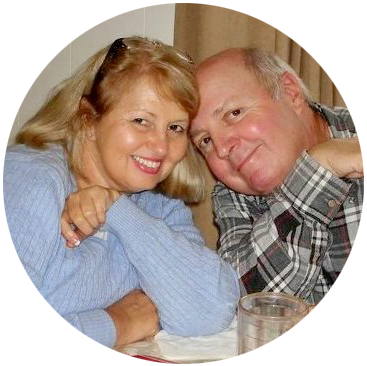 Jerry Hill, my husband and I are from Olympia in columbia, SC. I know you are familiar with it. We were married in 1975 and lived on Tall Pine Circle while you and Leo were down the street in your home. My eldest daughter Mellisa Bunch went to Idela Kirklands with Wendy. We have followed Woody and Leo since the 60’s when they began. My first memory is our “Hopporuny”. Remember? LOL Ha, you should add that to the first page with the dances. That would really throw some young folk today. LOL. What a wonderful radio station and beautiful cottage. The beauty of it all is you took the “HOME” place and turned it into your own. From 1700s to today, as you walk that land I can only imagine the memories and values you have come across with Leo. Do hold every image of every step along this slice of heaven close o your heart. Oh if only walls could talk. What a lovely tribute to the family that you share with all of us.. Pray you and Leo continue with a blessed life. I recently discovered your blog & have been following you. I love your garden! It’s really beautiful. I also love your screened porch. I wanted to comment on tne butterfly picture your mother-in-law made. Have you ever posted a close up photogrpah of it? It looks beautiful from a distance but I’d love to see a full shot. What a treasure to have. I have many things made by family members long gone & I love seeing the details of their work. LOL I had to laugh at your last remark! I love your living room and I know what you mean about wanting to live in a house with character…yours certainly has that. I love the floors and I love the fireplace…I wish our living room was that big and had a fireplace! We’ve got a wood stove so I shouldn’t complain 🙂 I have a bread bowl similar to yours 😉 This room looks so cozy…I can’t wait to see more. Hi Jane, your living room is so pretty. Love the walls and all the white. I have that same floral fabric in two chairs in my living room, and a green couch! You had me at white walls Jane. Well, the egret sealed the deal. Thanks so much for sharing your space with us! Oh I love how you gave us an indepth tour. It is so nice to see all the personal touches and yes especially the one done by your husband’s mother. So touching. I agree with you I long for a home with character. Jane- love your living room too. I tell you each room in your home —speaks of HOME to me! I would feel so comfortable and welcomed into your home. You gave me a chuckle with your “this is where it all happens, no S** but the computer!” comment… I had to chuckle good at that one. Thanks for the tour around your home… can’t wait to see more! I totally dig your blog. Love your living room, that white lampshade and your style of writing. Fabulous. Count me as a regular from now on! It is all great That chair “FIT FOR A KING” KING LEO! Thanks for inviting me to come by your lovely cottage today! I love it and wish I had one just like it. I would be on that porch all day long…..! I have some low country baskets from Charleston in my bedroom. They are so unique, so American, and i love that I got to see and meet the women that were weaving them with the pine needles before I bought them. That was fantastic. that is woven and printed on — a newly made barkcloth, correct? 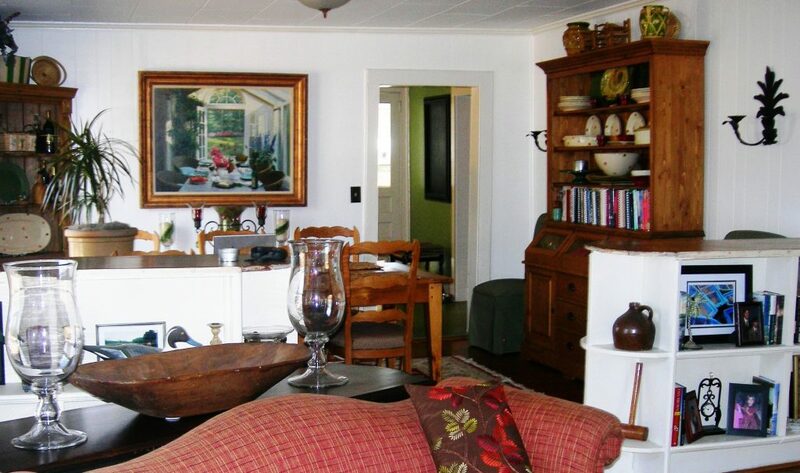 Hi Jane- You have such a great home full of love and character! I love the kitchen and I can definitely see those plates in there! You have a good eye! Thanks for stopping by my blog! Jane – I LOVE your living room! I live in a small house too. I would love to have your living room. The tapestry piece is beautiful. It is so rich with history that you were right to give it a place of honor. I think it should be in Southern Living as well!! Thank you for sharing it with all of us. Thanks for “visiting” me, Laura. I’ll put up some more pictures of the house in a few days. I found it. I love your “cottage” and think it should be in Southern Living. Have you considered that? I especially love the art work of Leo’s mother. What a treasure. Can’t wait to see the next post. Keep it up. I’d love for you guys to come visit in the spring. We’ll have some things growing in the garden by then.